The Drift Map shows Kingsland Road and Stoke Newington High Street as parts of Roman Ermine Street, which was the main road to the north. The Romans had no compass, so they set out straight roads from hill-top to hill-top. Almost always, changes of direction take place at the tops of hills. This map shows the confluence of the Hackney Brook and the River Lea. The 25 foot (8 metre) contour and the settlements in Hackney, were on the well drained gravels and not on the unhealthy alluvium of the marshes. Most known Roman sites lie on sand, gravel, or mixed clays (Bolder Clay, Clay-with-flints, Claygate Beds, and Brickearth). In contrast there are few sites on the London Clay, which would have been more difficult to cultivate because of its poor drainage and heavy soils. The map shows that the Hackney Brook divided the area in two. 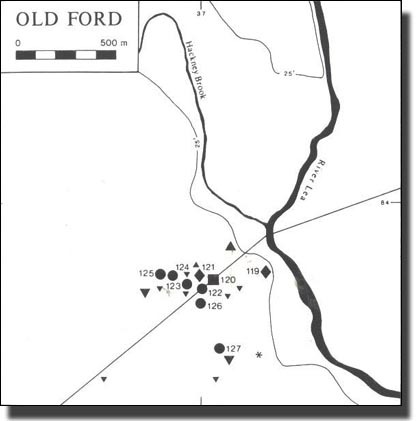 The major road systems developed on the high ground on either side, with marshy ground, difficult to negotiate, in between. 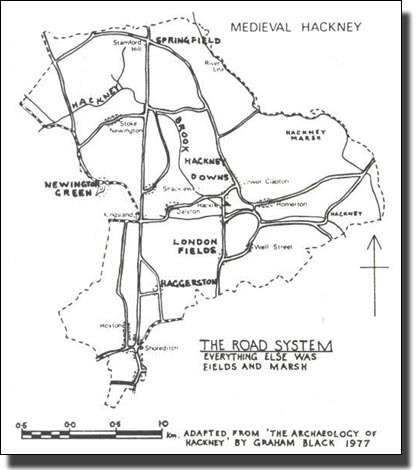 Today they are linked by a network of roads, but in medieval times, ther must have been two very distinct systems which met only at Stamford Hill and Homerton.